Hermosa Beach Median Prices Again Top the $2.0M Mark! July was a crazy month throughout the South Bay with double digit year over year percentage changes in most of the cities. There was no real rhyme or reason to it with some cities way up and others way down. Hermosa Beach real estate may have been the most dramatic of all the monthly changes with just under a 44% increase from July of 2016. Median home prices were just over $2,000,000 for the month which was over $600,000 more than a year earlier! June 2017 was a big month for home sales in Hermosa Beach with a high number of homes selling. This small coastal town outside of Los Angeles saw a relatively huge 26 homes closing escrow during the month. The 26 home sales saw a median sales price of $1,718,000. The summer months are always an active market in this coastal community due to the ideal weather and location. Click here to see all of the recent home sales in the Hermosa Beach and South Bay. Coming soon to Hermosa Beach, 541 Gravely Court. This off market single family home is charming, bright, move in ready and in a great location! This charming single family home in the Hermosa Hills is located on a quiet cul-de-sac, has been upgraded throughout and is as beautiful inside as out. The home enjoys plenty of natural light with an open and inviting floorplan. Indoor features include two large bedrooms with far more space than the traditional 2 bedroom home, tiled kitchen and living room, new windows and shutters and direct access to both the front and rear patios through beautiful french doors. The outdoor areas have been meticulously landscaped and includes a beautiful terraced backyard with an oversized deck and fire pit. Second and third floors would have big ocean views. Live in now and build later! 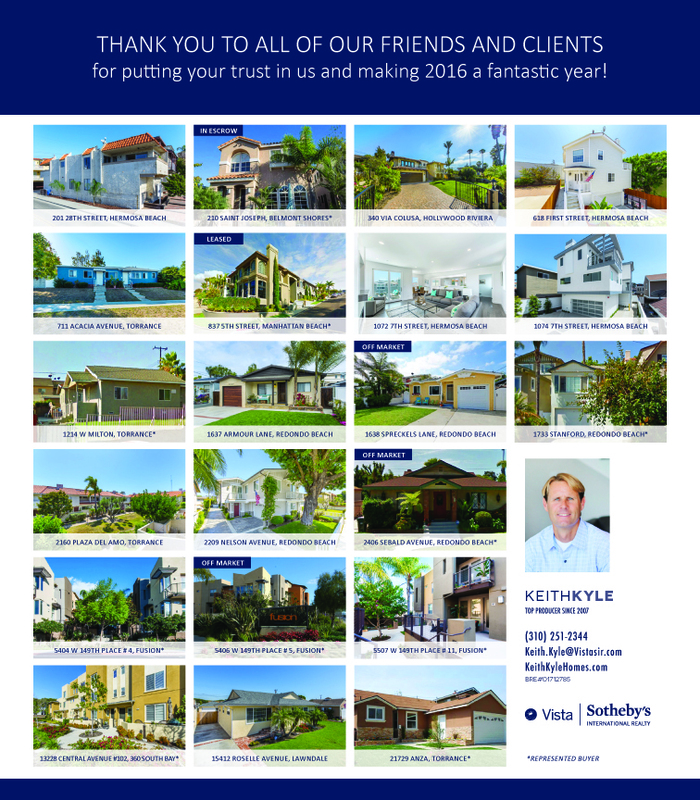 Contact Hermosa Beach listing agent Keith Kyle with Vista Sotheby’s International for more information. Vista Sotheby’s International Realty recently announced that they are the number one real estate brokerage in Hermosa Beach since 2015. Working for this global company has allowed me to combine my local expertise and knowledge with the ability to reach high end buyers both nationally and internationally. We are proud to work with the top real estate firm in the area and hope that we can help you with your real estate needs. With housing inventory in Hermosa Beach real estate seemingly never increasing, the oceanfront Strand is certainly the exception to the rule. As of March 21st there were 8 homes for sale on the Hermosa Beach Strand. The Strand is the beachfront strip made up of modern masterpieces, luxury homes and many original beach bungalows. Currently the lowest price beachfront home in Hermosa is priced at $6,900,000 being sold for land value with the highest priced home at $25M located at 2806 The Strand. One of the more interesting homes for sale is the home of Beverly Hills 90210 fame located at 3500 The Strand which sits on the border of Hermosa and Manhattan Beach. There are a number of Manhattan Beach oceanfront homes for sale as well. Let us know what's important to you...the more information the better we can help. Need a yard?looking to be oceanfront? north of the pier? walk to downtown? 2016 was a big year for home sales in Hermosa Beach. There were 225 recorded home sales with an average sales price of $1,909,000 and and an average list price of $1,962,000. See below for a full list of the homes that sold in Hermosa Beach in 2016. We wanted to take a moment to thank our friends, clients, and family for making 2016 another successful year in real estate. We appreciate each and every one of our clients for putting their trust in us. We hope we have the opportunity to be your Hermosa Beach Realtors! August 2016 was a solid month for homes throughout the South Bay with Hermosa Beach seeing a sizable median increase from August of 2015. Hermosa Beach saw 22 closed home sales in the month of August with a median home price of $1,723,000. As of October 25th 2016 there are 112 active homes and income properties for sale in Redondo Beach and 129 homes currently in escrow. The lowest priced sale in August was a 1 bedroom condo in The Victorian on Prospect at $425,000 with the highest sale at $6,450,000 for an oceanfront Strand home on a half lot. View the current homes for sale in Hermosa Beach, CA or view a list of the homes sold in Hermosa Beach and the South Bay in August. In a win for Hermosa Beach, a court said the city can continue enforcing its short-term rental ban.